This is Garky. Garky spent almost a whole day sitting in chairs with Younger Daughter, shooting down the vampires in the trees, and generally sharing many other adventures before geting injured and requiring bandages. Now she lives in this vase. 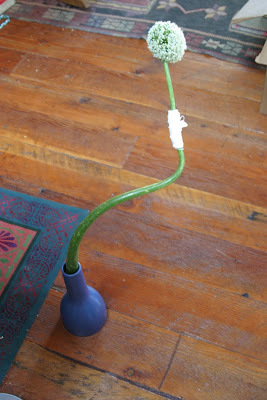 You might mistake her for some kind of Sogetsu Ikebana*, but you would be mistaken. Despite my daughter's belief that she can hold vampires at bay, she is really an onion flower (don't tell Younger Daughter). This is the same daughter who personifies such characters as Snitch, Miru, Grumpo, Cute-o, Wadro, Sicko, and Happo. They all talk in a strange way, saying "You too nice to me" instead of "You're too nice to me". Snitch likes to eat hair and fingers, because it thinks they are worms. You must keep these things away from it, or it will grab and eat them. Miru likes to eat fresh skulls with brain juice, as well as having a fondness for the flavor of cactus, and always hugs its pillow. If it loses its pillow it gets really sad and goes and looks for it. If anyone steals its pillow, it bites them. Grumpo complains all the time, about everything, including nice things. If you're nice to it, for example, it says you're nice to it too much. Cuto is incredibly cute, but loves to bite off your limbs, and can go for ages and ages without food or water. Wadro loves its hole. Its hole is any area of water (other than the ocean). If you go in its hole it drags you under and drowns you. When there is no water, Wadro cries, "Hole! Where hole!" in a piteous voice. Happo is always happy and okay with everything. Even if you beat on it or say mean things. Happo is the teflon of characters, to the detriment of itself and everyone else's sanity. Characters appear when Elder Sister bings them into existence with her invisible magic wand. The term "characters" is not to be confused with Annoying Little Character, a hand-creature who is incredibly annoying and cheerful, singing its Annoying Little Character song and dancing until someone slaps it, whereupon it lies down and gets sick for awhile. Only time passing can improve its health. These are not the only characters who appear. When Elder Daughter was three she became intensely enamored of a butternut squash that my father had drawn a cartoon face on with a Sharpie. She called it her "heavy baby" and carried it everywhere, in the car and into bed. We had difficulty with the gales of mirth trying to get out, but we bore with it until it got so shrunken that it had to be disappeared, whereupon she spent several weeks looking for it. I remember reading an interview with Frank Zappa many years ago in which he talked about following his son Ahmet (aged perhaps three at the time) around trying to catch the lyrics to a song he sang called Frogs With Dirty Little Lips. It fascinated him, he said, because it was such a great concept, and because the words changed all the time, and it drove him crazy. Now I find, looking it up, that he actually did put the song (or some momentary version of it) on his album Them or Us. I need not mention how much I love how Frank Zappa's mind worked. It is a secret, or used to be. So I suppose, despite our poor housekeeping skills, my household has its interesting moments. At least the Characters don't argue with me much. 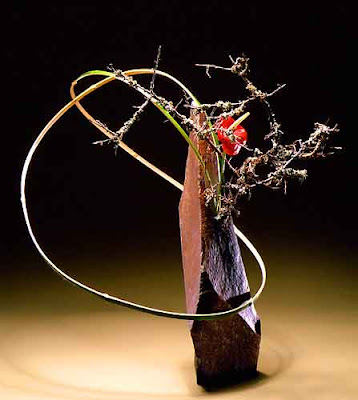 *More on Ikebana and Sogetsu: "the great difference between the Sogetsu School and [traditional] Ikebana lies in the belief that once all the rules are learned and the techniques mastered, there is an unbounded field for freer personal expression using varied materials, not just flowers." [wiki] Curiously, I think the same kind of thing could be said about play. And about storytelling. Or even, perhaps, things like manners and who you feel like being, at the moment.